I've never had any problem finding a Sit n Go game or multi-table tournament at Intertops Poker. It's always been one of the most active US-friendly online poker rooms. But with their Frequent Player Points Leaderboard Race, $2000 Reload Bonus, $1000 Free Roll -- not to mention a drastic increase in active players over the last month -- Intertops is busier than ever these days! With less than two weeks left in the May Frequent Players Points Race, competition for a share of the $2500 in prize money is heating up. All Frequent Player Points collected until June 1st count and the top 40 players on the leaderboard at the end of the month will win a share of the prize pool. Right now three or four players are neck and neck as they battle it out for the top prize. 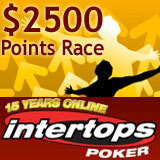 Until May 26th, Intertops Poker’s Reload Bonus automatically doubles players’ deposits (up to $2000). To claim this bonus, players should enter the bonus code 2kreload when they deposit. A freeroll poker tournament at the end of the month will give players a chance to win big money while risking nothing. Every player who makes a minimum $20 deposit between now and May 26th using the reload code will receive a ticket to play in the $1000 Freeroll on May 29th. This is a free poker tournament with a guaranteed $1000 prize pool. There are also several freeroll tournaments every day where players can get their bankroll started with no risk at all. After fifteen years of excellent service, players trust Intertops to offer the best bonuses and promotions and to make their withdrawals quick and easy. The US-friendly online casino, poker room and sportsbook welcomes players from around the world. to tell other readers what you thought of it.